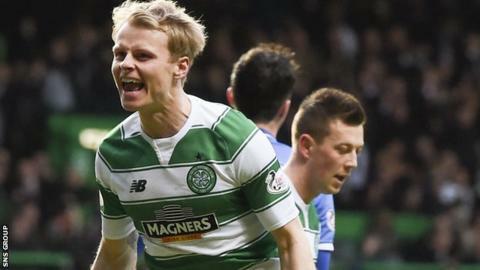 Gary Mackay-Steven is determined to help Celtic beat Ross County on Sunday and reach the League Cup final so he can feel part of it this time around. The midfielder, 25, watched from the stand during last year's final as his new team-mates defeated his old club Dundee United just days after he made the switch from Tayside. "It was a bit strange," he admitted. "I wasn't sure who I really wanted to win to be honest so hopefully now I can play my part." Celtic continue the defence of the trophy at Hampden on Sunday, with the winners meeting either Hibernian or St Johnstone in the final. Mackay-Steven confessed that he would rather have watched last year's final at home because of his mixed emotions. "I was in the dressing room celebrating with my new team-mates but you're a little bit sad for your old team having gone through the whole competition with them," he said. "It was strange. I probably would rather have not been there. "I was even on the pitch as the boys were celebrating at the end but I was just standing there feeling a bit awkward. I want to be properly involved this time." The winger also insisted that the players are not discussing the possibility of landing a domestic treble. "That's certainly the aim for everyone but it's not as easy as that," he explained. "The pressure on Celtic is on every game, not just the semi-final of a cup. "You are expected to win every game, you are expected to win with flair and creating a lot of chances so there is definitely added pressure but we don't think too much about that. "There are no easy games at this stage of the competition and we know Ross County will be ready." Can Ross County topple Celtic again? Read more on Ross County v Celtic: Can Staggies upset odds again?